Glad you're here! I'm videogame composer Winifred Phillips. My work as a game music composer has included music for projects released on nearly all of the gaming platforms, from one of my most recent projects (a Homefront game released on all the latest consoles and PCs) to one of my earliest projects (a God of War game released on PlayStation 2, PlayStation 3, and PlayStation Vita, pictured above). Lately, I've also been creating lots of video game music for awesome virtual reality games developed for the Oculus Rift, Oculus Go, HTC Vive, Samsung Gear VR, PlayStation VR, and lots of other top VR platforms. One of the things I've noticed while working in VR is the immense importance of the audio delivery mechanism. When audio is painstakingly spatialized, it becomes crucial to convey that carefully-crafted spatialization to the player with as little fidelity loss as possible. With the importance of this issue in mind, for the past few years I've been periodically writing about headphones in relation to their use in virtual reality. As game audio experts, we want to make sure that players are using the best kind of headphones, so that our work isn't distorted or deteriorated. To that end, in these articles we've been taking a look at new types of headphones that offer technology designed to enhance the VR experience. We've also been considering how consumers use headphones, and some end-user problems that might come up along the way. In this article, I'd like to revisit some topics we first touched upon in previous years, so that we can see how that tech is progressing. Let's get started! Audeze debuted its iSINE Virtual Reality Headphones in January 2017 at the Consumer Electronics Show in Las Vegas. These in-ear headphones touted planar magnetic technology as the driving factor behind their ability to deliver more convincing 3D audio for VR. While most headphones deliver sound by virtue of the standard dynamic driver (a.k.a. the moving coil driver), iSINE has focused its attention on planar magnetic technology. For a discussion of what planar magnetic technology offers and why it may be significant to the VR gamer, you can read about the Audeze iSINEs in my article from last year. Audeze completed an Indiegogo campaign for the Mobius in March, raising over a million dollars from over four thousand backers. It will be interesting to see if a Mobius success story might inspire more manufacturers of gaming headphones to begin incorporating planar magnetic technology into their products. Of course, we can't forget that crowdfunding campaigns can be risky (as shown by the unfortunate story of the OSSIC X later in this article), but since Audeze is an established headphone manufacturer with a well-known track record, we shouldn't have to worry about the Mobius failing to ship. For a very different story, let's now get an update on the fate of two prototype VR headphones we discussed a year ago. 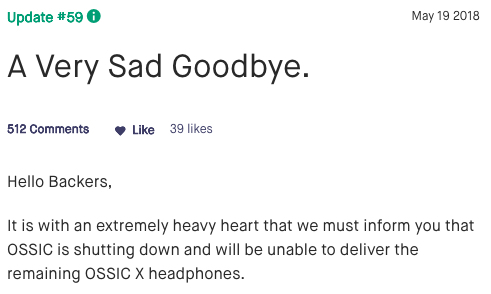 I have the sad duty to report on the demise of two promising headphone models. These products announced themselves during the height of popular enthusiasm for the nascent VR industry, and for awhile it seemed like they had seized their opportunity at just the right time. Let's start off the discussion with the OSSIC X. Back in 2016, I first wrote about the OSSIC X headphones, which were being described by OSSIC founder and CEO Jason Riggs as the "Oculus for audio headphones." When the Kickstarter campaign for OSSIC X netted a whopping $2.7 million dollars in April 2016, the press began hailing the famous prototype headphones for their historic achievement in breaking Oculus' record as the largest VR crowdfunding campaign to date. OSSIC followed this up with an additional $500 thousand dollar Indiegogo campaign, and everything looked promising for awhile. The headphones were purported to calibrate to each wearer's unique ears by virtue of what the OSSIC folks were calling "individual anatomy calibration." Using eight discrete drivers, the headphones would be able to play back sound to the correct portion of the ear, fully simulating the natural Head Related Transfer Functions of each wearer. For a fuller explanation of Head Related Transfer Functions, check out this article I wrote back in 2015. A year later, I checked back in with the OSSIC X to see how things were going, and I interviewed OSSIC's creative director Sally Kellaway. We discussed some of the features of the forthcoming headphones, and Kellaway clarified a few issues in regards to the required developer-side plugin that would enable a VR game to fully avail itself of the OSSIC X's Head Related Transfer Functions. While all these details painted an appealingly sunny and optimistic picture for the OSSIC X, some dark clouds were beginning to appear on the horizon. OSSIC began announcing delays in their production schedules, and prospective purchasers discovered that they could no longer pre-order the product. Then, in April the company raised an additional $100 thousand dollars on the StartEngine crowdfunding site as they prepared their product for mass production. Why was OSSIC going back into fundraising mode at this stage? A month later, all these portents of doom were fully realized. On May 19th 2018, OSSIC announced via its Kickstarter and Indiegogo pages that it would be unable to deliver the OSSIC X headphones it had promised (as pictured right). So, what went wrong? After an historically successful crowdfunding campaign, OSSIC managed to fully design the product and ship just eighty units to some developers and a few early backers. With only a smattering of units delivered, the OSSIC team explained that "the product still requires significantly more capital to ramp to full mass production, and the company is out of money." Whereupon OSSIC abruptly shuttered its company, leading to an outcry from the tens of thousands of product backers who had contributed over $3.7 million dollars to the crowdfunding campaign. The Washington Post published an article about the failure of the OSSIC X to keep its mass production promises, and backers of the OSSIC X launched a Facebook page for a planned class-action lawsuit. The situation couldn't be any messier, or sadder. The OSSIC folks had an intriguing idea regarding customized HRTF and increased fidelity of spatialization. Perhaps another company will take up these ideas and execute them with a more cautious and frugal business plan. The story of the OSSIC X may provide a useful case study, as well as a cautionary tale, to those audio technology companies who may aspire to create a revolutionary headphone product for VR. Then there's the story of the Entrim 4D. First announced by Samsung over two years ago, we initially discussed the Entrim 4D headphones in an article from September 2016. Like the OSSIC X, the Entrim 4D headphones are designed specifically for VR. However, that's where any similarities end. Unlike other headphones, the Entrim 4D wasn't designed to blaze new trails in audio quality and spatialization. Instead, they were designed to literally rock our world. The Entrim 4D directs low level electrical impulses into the wearer's inner ear in a process known as Galvanic Vestibular Stimulation. Once these impulses reach the nerve regulating balance, they work to create the illusion that the wearer is moving. Depending on the nature of the pulses, the wearer may feel varying types of movement, and these sensations can be customized to match the kinetic activities within a VR environment. In other words, the Entrim 4D claimed to solve the inherent problem causing VR nausea - that our visually-perceived movements do not match our physically-perceived movements. 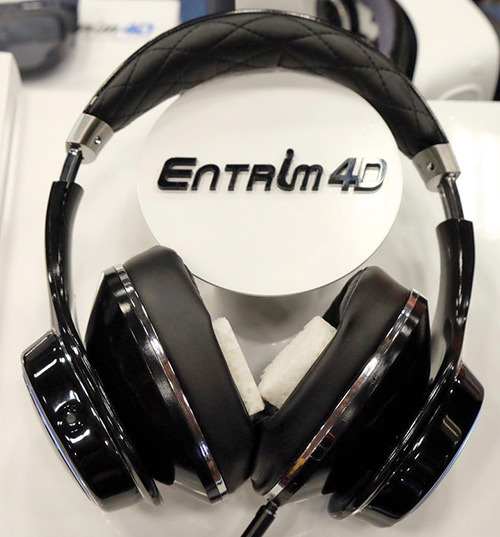 The Entrim 4D headphones made a few appearances at some technology conventions such as SXSW 2016 and the Samsung Developers Conference. And then... nothing. If you've been a regular reader of these articles, you'll recall that we've been revisiting this subject periodically to see if the Entrim 4D headphones might eventually pop up again in the news, or make another appearance at a technology event. At this point, with such a long period of silence firmly behind us, I think we can comfortably draw the conclusion that the Entrim 4D headphones will not be seeing a retail release. While all these developments are intriguing, they unfortunately don't involve any sort of integration into audio headphones (as the Entrim 4D would have). So at this point, let's move on to an entirely different topic relating to the use of audio headphones in VR. Back in 2015 I wrote about a tricky issue associated with the use of headphones in VR... or, more specifically, a popular misperception about the use of headphones in VR. At the time, I'd noticed that many gamers and game journalists were recommending surround sound headphones for VR use. This is, as we know, completely wrong. Surround sound (as pictured left) interferes with the binaural signal of the VR game, degrading the quality of the positional audio that the game is trying to deliver. Back in 2015, the message hadn't really gotten out that surround sound headphones are incompatible with VR. In fact, there was some confusion regarding what the difference was between surround sound and other formats (binaural, ambisonic, etc). This kind of confusion is exactly what leads consumers to waste money on expensive surround sound headphones for use with their brand-new VR rig. So, as a part of this update article, I thought I'd revisit the issue and see if the situation has improved. Are people still talking about surround-sound formats and spatialized VR audio as though they're the same thing? Well, the problem certainly hasn't gone away. For instance, Scientific American published an article last year about advances in VR sound with the title "New VR Tech Aims to Take Surround-Sound to the Next Level." The article itself discusses the importance of headphone-delivered spatial audio in achieving a sensation of presence in virtual reality. The title, however, serves to perpetuate a misconception that surround sound and other types of spatial audio are essentially synonymous when used with headphones, when they are definitely not. These kind of false equivalencies continue to be drawn by publications such as The Verge, which described ambisonics as a "full-sphere surround sound technique," that works to "trick your brain" into "assigning positions and distance to sounds, even when wearing something like headphones." Describing ambisonics as a "surround sound technique" and suggesting that this surround sound works great in VR when you're wearing headphones is a problem - it may confuse players into thinking that surround-sound headphones are viable for VR. 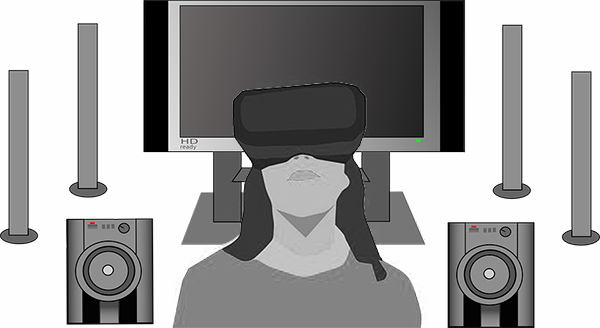 In a similar vein, the technology site Tech.co began an article about VR gaming by suggesting that the reader might "put on a VR headset and add over-ear 7.1 surround sound headphones." We all know that applying 7.1 surround sound encoding to VR audio would seriously degrade the sound quality. And, of course, let's not forget the products that are still on the market, claiming to enhance the experience of VR by virtue of surround sound headphone technology. As a fun example, let's look at a bizarre product advertising itself as an ideal solution for VR sound. The 'HaloSurround' (pictured) has an amusingly peculiar visual aesthetic. It combines a set of in-ear headphones with a black hoop-shaped contraption worn on the top of the head like a hat. 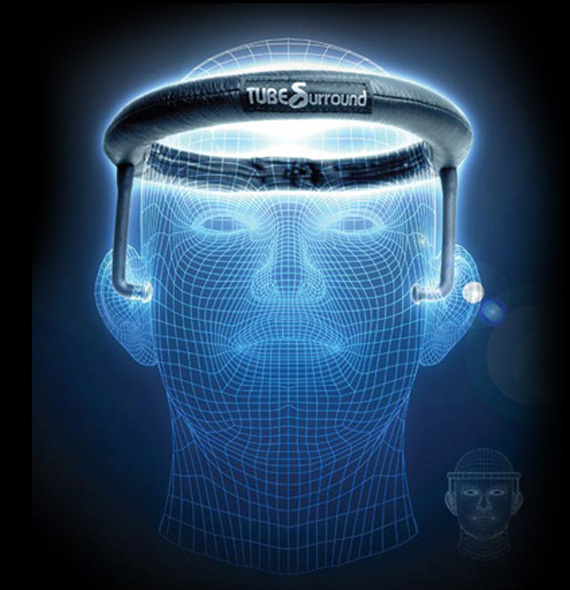 Resembling a 'halo' only in the vaguest sense, the HaloSurround headphones deliver 5.1 surround sound through the six speakers mounted inside the 'halo' perched on top of the wearer's head. Just to complete the overall weirdness of this product, the HaloSurround is available in a model that includes its own Google Cardboard-style VR headset designed for "VR apps". So again, what we're seeing here is a false connection drawn between surround-sound headphones and VR. At the moment, it seems that most gamers are resorting to online forums to sort out their confusion in regards to whether surround sound headphones should be used in VR. While the PlayStation VR has always included information about this in the FAQ area of their web site, the Oculus and HTC Vive sites offer no easily-discernible guidance on this issue. Considering how much effort and care are devoted to the creation of convincing aural worlds for VR, it would be a shame if some players missed out on the experience because they were using the wrong headphones. I'll be keeping an eye on this issue, in the hopes that some more definitive guidance may be forthcoming from the VR headset manufacturers. In this article we've revisited topics of interest connected to VR headphones, and we've been brought up to speed on current developments with several headphone models. In my next article, I'll be exploring what's brand new in the world of headphones for VR. In the meantime, please feel free to share your thoughts in the comments section below! Winifred Phillips is an award-winning video game music composer whose recent projects include the triple-A first person shooter Homefront: The Revolution. Her latest video game credits also include numerous Virtual Reality games, including Scraper: First Strike, Bebylon: Battle Royale, Fail Factory, Dragon Front, and many more. 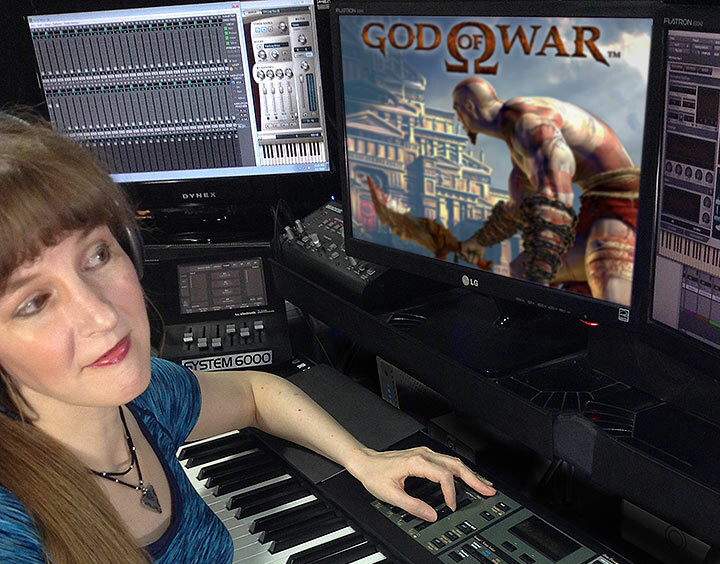 She has composed music for games in five of the most famous and popular franchises in gaming: Assassin’s Creed, LittleBigPlanet, Total War, God of War, and The Sims. She is the author of the award-winning bestseller A COMPOSER'S GUIDE TO GAME MUSIC, published by the MIT Press. As a VR game music expert, she writes frequently on the future of music in virtual reality games.